The search is on for Britain’s funniest friends and family! Oxfordshire-based toy company Ravensburger is giving puzzle fans a chance to feature in their bestselling What IF? jigsaw range. 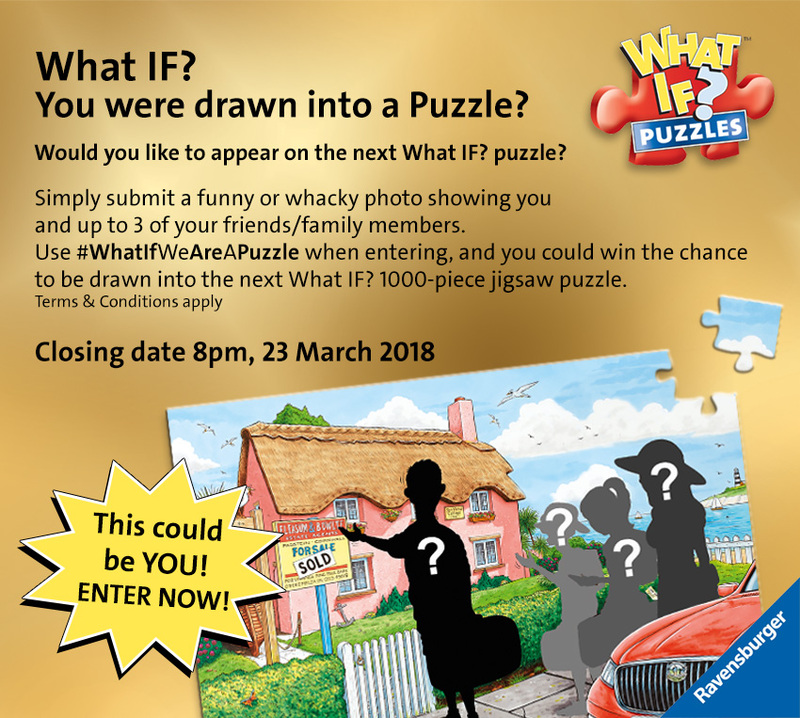 Launching on 5th March, entrants will be asked to tweet their best funny family and friends photo using the hashtag #WhatIfWeAreAPuzzle. The winning group will be drawn into the next What IF? 1000-piece puzzle, depicted as entrants in a Challenge-Quiz-Show type scenario. Number 21 in the popular What IF? series, the illustrations will be the brainchild and handiwork of much-loved artist, cartoonist and comedy writer Geoff Tristram. The winners will also win Geoff’s original signed artworks, and copies of the finished jigsaw puzzle, which will be on sale to the public from January 2019. Launched 5 years ago, What IF? is a firm favourite with puzzle fans across the UK. The series reflects life’s unexpected twists and turns and challenges the consumer to imagine “What IF”??? Because the puzzle image isn’t shown on the box, consumers need to use the visual and written clues to help them imagine what the finished jigsaw puzzle might look like. One thing is for certain – expect plenty of smiles along the way! Cornée Marlow, Marketing Services Co-ordinator commented: “We are so excited to launch this unique and exclusive What IF? competition! Our What IF? fans love to collect every design in the series, and we wanted to celebrate the 21st edition by doing something really special and different. Being part of a puzzle design is a once-in-a-lifetime money-can’t-buy prize, and we can’t wait to see how creative people can be with their entries! Geoff Tristram has created caricatures of many famous faces, so our winners will be part of a very exclusive club. We look forward to working with Geoff and our winners to create a unique, exclusive and funny puzzle design”. This entry was posted in Guest Post, Kids.